It’s time to set your healthy eating and performance goals for the new year. While the holidays were filled with joy and indulgence, the side effects of poor nutrition and inactivity can make it hard to ramp up your training in the best way. I would like to show you five foods that are relatively easy to find and to incorporate into your regular diet. When ingested regularly, these foods will supplement the body with the necessary enzymes, minerals and trace elements we often lose during training and during our day-to-day lives. By ingesting these minerals and superfoods in their organic and natural form instead of through pills, you can maximize their use for your body and help ensure you are seeing the training gains you need in order to reach your performance goals. Ume vinegar is not vinegar in the exact sense. It is the juice produced by the long fermentation process of Japanese apricots. It is, according to my many years of experience, a rich source of minerals, trace elements and enzymes. I consider it the secret weapon among super foods. Perfectly suited for salads, it is also very good for flavoring meals, or just to drink with water. It removes inflammation, speeds regeneration—especially important as your training begins to ramp up after the off-season is over. Millet is very important among the cereals for its alkaline benefits. During Christmas, we often drink alcohol and eat a lot of sugar. Similar to vinegar, the millet grains can help to equalize the pH level in our body. 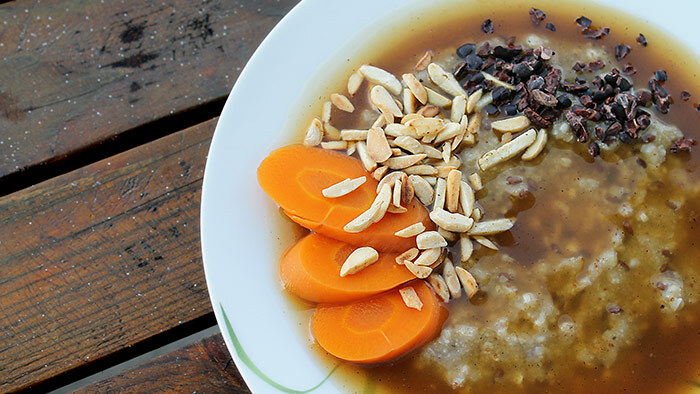 There are numerous ways to prepare and serve millet: salads, mash, burgers, soups—although I prefer to prepare a millet sweet porridge or millet dumplings. During the preparation of the millet porridge, I recommend that the millet cook for a long time. Approximately 40 and 60 minutes. They have the ability to hold large amounts of water and help keep the body hydrated for a long time. Fermented vegetables are another great way to supplement the body with a lot of enzymes and minerals. You can prepare pickles yourself or buy them at stores or at various farmer markets. We have been preparing pickles for years with my dad. We always have jars of pickles in the kitchen in large bottles ready to eat after every meal to help optimize digestion. There have been numerous articles written about the benefits of maca root. It’s an immensely nutritious dietary supplement that can complement the body with what it loses when consuming more sugar or animal products, during hard workouts, and also during the cold winter, when temperatureschanges very often and the body has to compensate for these changes by using more energy. I usually use maca powder after training like shakes with pea vegan protein, rice syrup, and soy milk. Of course, you can choose your favorite smoothie flavors and mix it with some maca powder with a limited effect on the taste. Try experimenting with peanut powder, mesquite powder, cacao powder, dates, maple syrup, chia and flaxseeds for optimal nutrition in every glass. Editor’s note: Maca root powder is currently classified as a Group D banned substance in Australia. Rice syrup is a great substitute for plain sugar. It consists of glucose, maltose, dimaltose and trimaltose. Gradually, the body uses the glucose and energizes continuously. Consider replacing your morning sugar hit with rice syrup in foods like coffee, yogurt or oatmeal for lasting energy. Finally, it’s important to remember not to restrict yourself too much with your diet. By making some simple changes and incorporating more whole foods, vegetables and lean proteins into your daily diet rather than pills and powders, you can ensure you have the energy for your demanding training (while still earning a treat here and there). Jakub Pawlas studied sports education, sports nutrition and regeneration at Masaryk University in Brno, but he has been interested in nutrition since he was 17. Over the past five years, he created various sports projects and has worked with many athletes to find optimal performance and nutrition success. He’s prepared food for the Czech Ski Team and Czech Rowing Team, as well as for Czech athletes during the Race Across America and the Australian Crococile trophy race.